The biggest recent news from Oregon has nothing to do with the armed occupation of a federal wildlife refuge near the high-desert town of Burns. 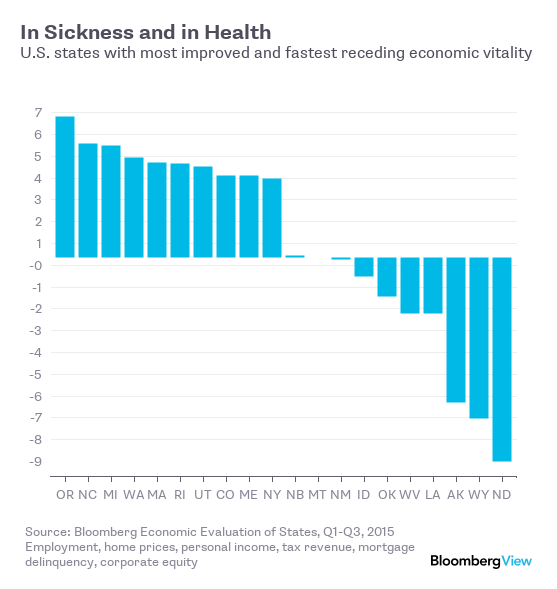 It’s about the state’s economic health, the most improved in the U.S. last year. By punching well above its weight in half a dozen comparisons that make up Bloomberg’s Economic Evaluation of States, Oregon’s economic health index rose the most through the first three quarters of 2015, according to the most recent Bloomberg data. The closest two rivals for No. 1, North Carolina and Michigan, were at least a full percentage point behind Oregon, failing to achieve the same consistency of improvement across the six business, financial and industrial values in the index.